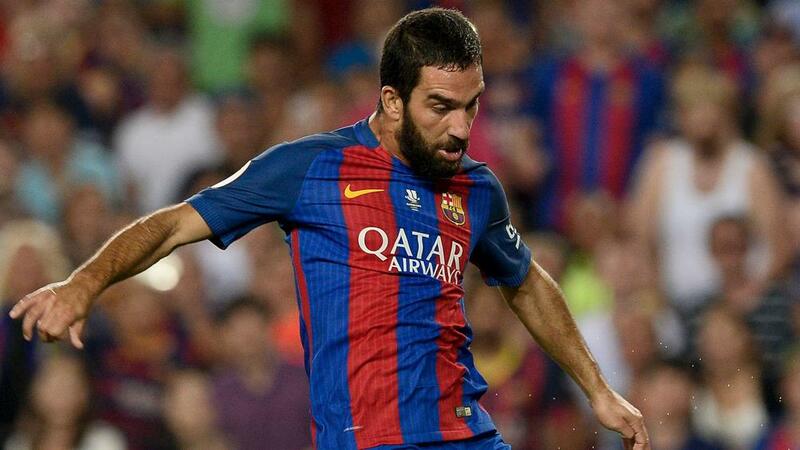 Arda Turan gave further encouraging signs he can turn his Barcelona career around with a brace as Luis Enrique's side eased to a 3-0 win over Sevilla in the Supercopa de Espana second leg at Camp Nou. The Turkey international's displays came in for regular criticism last season as he failed to find the form that persuaded Barca to prize him from Atletico Madrid. But, playing on the left of a front three due to Neymar's Olympic excursion, Arda impressed during Monday's 2-0 first-leg win at the Ramon Sanchez Pizjuan - laying on the assist for Luis Suarez's opener. Both teams were much-changed, with a knee injury ruling out Barca captain Andres Iniesta, but Arda remained to confidently open the scoring after 10 minutes. He added a second within a minute of the restart to extinguish any lingering doubt over the destination of the season's first piece of silverware, while Lionel Messi added gloss with an excellent header. Sevilla begins its first LaLiga season under Jorge Samapoli against Espanyol on Sunday (AEST) and the former Chile boss will hope these back-to-back losses, along with the extra-time UEFA Super Cup defeat to Real Madrid, have not taken too much out of the tank before a new era begins in earnest. Samuel Umtiti made a debut at centre-back, with Aleix Vidal facing his former club and Lucas Digne named at left back in a reshuffled Barcelona defence that Sevilla sought to take advantage of early on. Joaquin Correa played in Wissam Ben Yedder, who forced Claudio Bravo to save with his feet, and the Barca goalkeeper also reacted sharply to thwart Iborra from the second of two resulting corners. The reportedly Manchester City-bound Bravo was left somewhere between concerned and perplexed as the normally reliable Javier Mascherano chipped narrowly over his own crossbar under little pressure but, as in the first leg, Luis Enrique's men led against the run of play. Messi was the architect, linking with debutant Andre Gomes and clipping the ball into Arda's path for him to slide an assured finish across Sergio Rico and into the bottom corner. Bravo gave the Camp Nou faithful a dose of what they might soon be missing in the 32nd minute, plunging to his right to keep out an Iborra penalty that lacked conviction after Umtiti was penalised for handling Correa's shot. With the final attack of the half, Gabriel Mercado looped a diving header against the top of the crossbar to make Barca's lead seem even more fortuitous. It was an advantage doubled 55 seconds after the restart as first-leg goalscorer Munir El Haddadi harried Rico into a poor clearance that ricocheted to Arda, with a deflection off Mercado sending the ball high into the net. Revelling in his change of fortunes in Barcelona's famous colours, Arda almost claimed a hat-trick when chipped over from a Messi pass, before a period for Rico to forget continued. Digne's cross looked to be sailing over Messi but the diminutive forward hung in the air to steer a header back across goal into the corner, where a flailing Rico soon nestled alongside the ball. Barcelona were forced to play out a sedate final 11 minutes with 10 men as Mascherano limped off with all three substitutions used, giving Luis Enrique some cause for concern ahead of Real Betis' visit on Saturday, although his squad appears to be in smooth working order for their LaLiga defence.